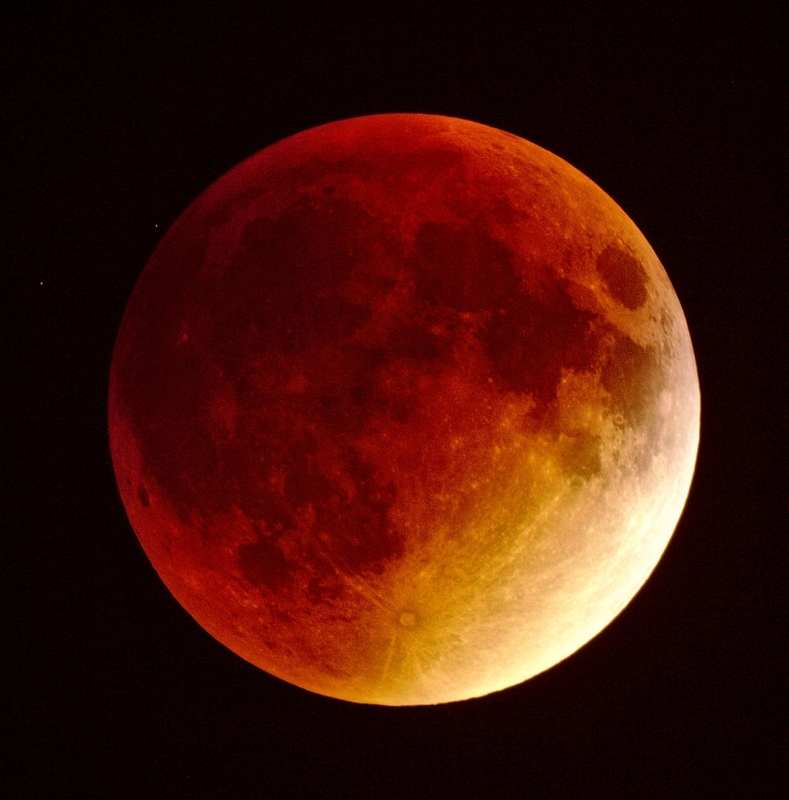 Total Lunar Eclipse September 28, 2015; photo by Radoslaw Ziomber via Wikimedia Commons. This month’s Full Moon is a Supermoon and total Lunar Eclipse in tropical Leo. As you may also have heard, it’s a “Blue Moon,” the second of two Full Moons in one calendar month. Astrologically, a Blue Moon is insignificant (and in some parts of New Zealand this Full Moon occurs on Feb. 1), but a Supermoon/Lunar Eclipse is interesting enough on its own. As always with astrology, the impact of this event may or may not correlate with important events for you. Those with placements in Leo (Sun, Moon, or Asc) should take note, and to a lesser degree all other fixed signs of the zodiac (Scorpio, Aquarius, and Taurus). By itself, a Full Moon in Leo correlates with a theatrical or dramatic culmination of events, situations, and projects. During a Lunar Eclipse, these culminations take on a more vigorous and accelerated quality; and during a Supermoon, the subjective impact is notably more intense. Because the Moon is closer to the Earth during a Supermoon, the Moon does appear slightly larger (and brighter) but not much different from other Full Moons. However, the Supermoons closer proximity to Earth changes the ocean’s tides and may correlate with anomalous weather patterns/earth changes. During a Lunar Eclipse, the Earth’s shadow crosses the lunar surface. While not enough to entirely block the moonlight, this projection of the Earth gives the Moon a reddish-brown color (it definitely won’t be blue); this is why Lunar Eclipses are also called Blood Moons. Both solar and Lunar Eclipses occur in pairs each year, and Supermoon Lunar Eclipses aren’t that rare. The media and various astronomy websites have gone a little bit overboard with the hype surrounding this eclipse, but it does get the public more engaged with the sky. That’s always a good thing. But the attention this particular eclipse is gathering is apt for the sign of Leo known for its ostentatiousness, flamboyance, and gravitas. Leo's ruling planet, the Sun, is the center of everything in the solar system after all. Occurring much closer to the lunar north node than other Lunar Eclipses have in the past two years, this Leo eclipse represents a sensational and accelerated pull towards the future. If you’ve felt stagnant lately, this is a helpful, collective push forward, the most notable since the eclipses of August 2017. Eclipses are catalyzing and fast-paced, especially in fire sign Leo. On the days surrounding this eclipse, you might feel compelled to step out a little more, allowing exposure for yourself or your work. Much like this Supermoon/eclipse itself, be mindful of overhyped exaggerations. With Venus in opposition to the Moon, look beyond appearances. The tendency to be fooled by glamorous facades can be one theme and pitfall of this lunar eclipse. But if you believe in whatever you’re putting out there, trust this lunation’s call to confidently step up and gain applause, attention, and recognition from others. Venus’ opposition in Aquarius invites us to reach out and embrace increased visibility. Given the polarity of Sun/Moon during a Full Moon, the tension between Leo and Aquarius becomes an underlying theme. The south node in Aquarius speaks of alienation, rejection, and profuse objectification. The Aquarian shadow takes the need for freedom and independence to the extreme edges of social isolation. With Venus’ involvement in the triple conjunction with Sun and south node, the negative face of Venus is also a dominant theme. In the Venusian shadow, there’s an excess focus on compliance and the need for approval to the point of obliviating one’s voice, uniqueness, or viewpoints. The negative face of Venus refuses to stand up for itself, allowing others (or the cultural expectations) to direct one's life, dampening free will. If this eclipse speaks more directly to you, it can represent a breakthrough in embracing the confidence to step out and shine. And with both Venus and Jupiter’s connection to this lunation, it supplies auspicious peak energy for parties and celebratory events, especially acknowledging the completion or culmination of something significant. But we also can’t ignore the fact that too much of a good thing can turn sour or ugly. Watch out for over the top displays of egotism. Undeserved pride can lead to humiliating downfalls. Be careful of overestimating what you’re capable of, or even taking a good time too far into mindless overindulgence. Jupiter’s square is a caution about overspending or overcommitting yourself to things outside of your capability. Quincunxes from Pluto and Saturn via Capricorn suggest pragmatic adjustments. Neptune's quincunx from Pisces is ego deflating. And the Sun, the lunar north node ruler, in Aquarius (plus the dynamic tension of this Full Moon), is an invitation to find balance, compromise, and integration between following your path and the will of the collective. If you’re mindful of those negatives, this Supermoon/Lunar Eclipse is an exciting culmination of creative and playful energy, touched by two benefic planets. It has the power to restore optimism, playfulness, joy, and a willingness to embrace new opportunities. Whether this eclipse is meaningful for you or not, find some way to let yourself be seen or heard. And trust that you deserve it. MEMBERSHIP INCLUDES RISING SIGN FORECASTS EVERY NEW AND FULL MOON, WEEKLY EMAILS, PLUS EXCLUSIVE BLOGS AND CONTENT. EVERYTHING YOU NEED TO KEEP UP WITH THE PLANETS!